Instead of veal stew, this is fish stew with a delicious white-wine cream sauce and a bunch of perfectly cooked vegetables. In typical French cuisine fashion, I had to prepare all the vegetables separately. Well, actually the pearl onions and peas were allowed to share a pot, and technically the carrots, turnips and mushrooms shared the frying pan (although separately), much like bathing kids, one at a time. The green beans had their own pot to blanch in. So, three pots later (two if you think ahead and blanch the pearl onions/peas and green beans in the same boiling water), the vegetables were cooked and sat on the sidelines while I finished the fish. 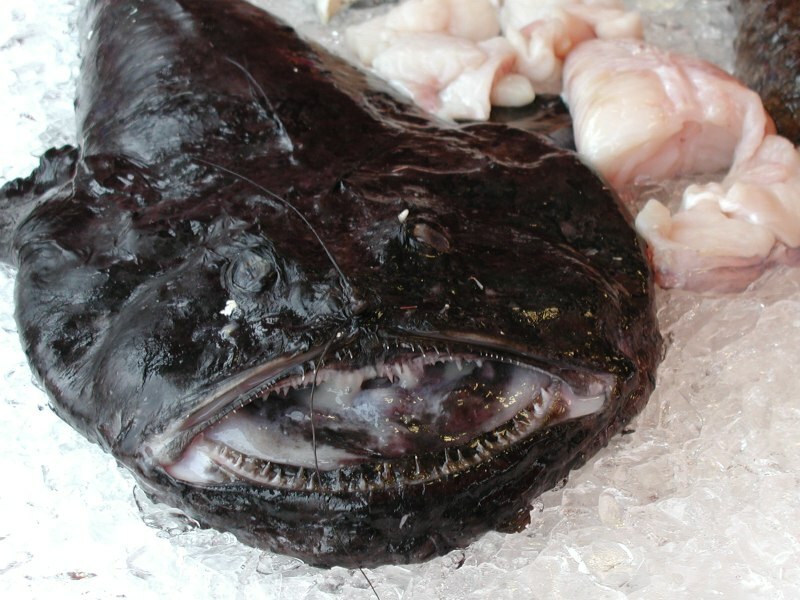 Monkfish is an ugly, large bottom-feeder fish. It has a firm texture and a delicate taste that is said to be "poor man's lobster". I was lucky to find some at my local fish store, but other bloggers in our Whisk Wednesdays group had trouble sourcing it. It turns out this fish is one that is overfished or caught in a manner that results in high levels of bycatch. I didn't know this until after I bought it, and my fishmonger said he gets it in every week from the Atlantic. I'll have to investigate this further if I make this again. I fried the cubed fish in some butter. After it was browned, the fish rested on the side while the shallots cooked in more butter. Then I made a bit of a roux with some flour and the butter from frying the shallots. This cooked for a bit to remove its floury taste. To deglaze the pan, I used some white wine. I returned the fish to its sauce to finish cooking along with some extra water for added moisture and a Bouquet Garni for added flavor. After simmering for 10 minutes, I removed the fish and set it aside while the sauce simmered for another 20 minutes. By adding the fish first, you're adding more flavor to the sauce, much like using a fish stock would. But you don't want to overcook the fish, so it is removed and the sauce gathers more flavor and mellows the acidity from the wine. After removing the Bouquet Garni, I added the hot sauce slowly to the liaison of cream and yolk, making sure not to curdle the egg. Then I returned everything, including the petits légumes to the pan and warmed it all up (avoiding any bubbles or boiling so that the sauce would not separate). With a sprinkle of parsley, thyme or chervil, this fish dish was ready to eat. 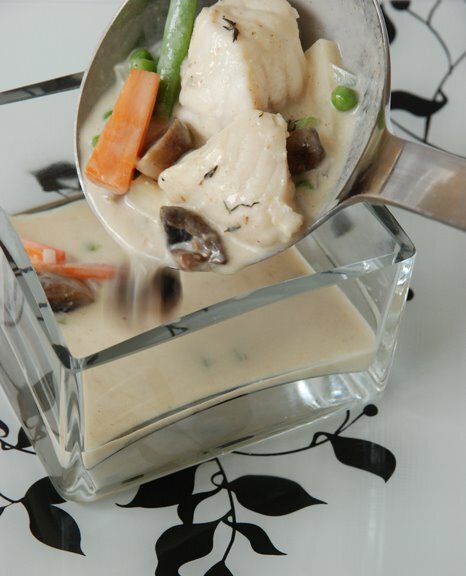 You can find the recipe for Blanquette de Lotte aux Petits Légumes (Monkfish in White-Wine Cream Sauce with Vegetables) in the book Le Cordon Bleu at Home. To see how the rest of the Whisk Wednesdays group fared with their recipe, click here (or check out the sidebar) and then click on each blogger! I loved this fish stew (even better than the veal stew we made earlier). The smooth, creamy sauce with its morsels of vegetables was delicious! And monkfish is a very nice tasting meaty fish. It doesn't have the fishy smell or taste that some fish have. I'm sure this recipe would adapt well to chicken too. ::Whisk Wednesdays::We're cooking our way through a cooking school curriculum using the Le Cordon Bleu at Home cookbook. The "classes" are based on the Le Cordon Bleu curriculum found online and used as a guideline. Not all the items in the curriculum are in the cookbook, but most are. Where the items are not in the book, we try to find a suitable substitution. Find out more here. This week, Kayte from Grandma’s Kitchen Table thought we should all share our cookbook holders, just for fun. We were discussing via email where we put our cookbooks while cooking or whether we print off the recipe or use a cookbook holder. I often just put the book on the counter since my cookbook holder often has a pile of ready-to-try recipes in it waiting for me (leaving no room for a book). After reading this post, my mom sent me a picture from her kitchen. No recipe holder needed. Scotch tape on the knob of the cupboard . . . and a 44 year old recipe (which happens to be my favorite birthday cake recipe — Mahogany Chiffon Cake from the vintage Betty Crocker's New Picture Cookbook, 1961)! I love the idea of a fish stew and this one sounds wonderful. Hearty and light all at the same time. I have never tasted Monkfish but will check it out -- soon! Classy photo!! I think I have that same cookbook stand. It is a lifesaver:) Love the photos!! Fish stew sounds fantastic! Ah oh....I forgot about showing the cookbook/recipe holders this week. I'll have to update my post!!! 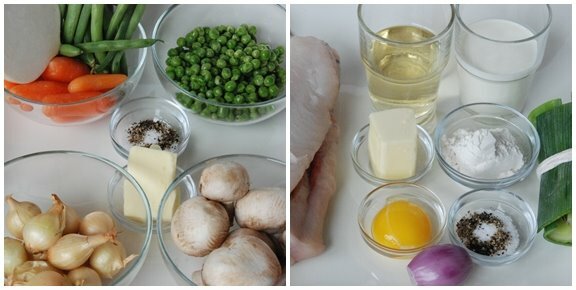 We like Monkfish and it is a very versatile fish...you can do just about anything with Monkfish. That's too bad about the monkfish. I've always wanted to taste it. It's extremely rare to find in Manila, though. Do keep us updated with what you find out so I'll know to avoid it for a long while. (I do see it in the produce market here in New Jersey, though.) It'll be more difficult now that I've seen your delicious stew! We tape up our recipes all the time when we work in the test kitchen and them make our note in pencil or marker (ballpoint pens don't like to write when held at that angle). Love the picture! The recipe looks and sounds really yummy! I love your first photo - so great the way you captured the soup pouring out of the ladle. Wow, you made the ugly fish look pretty. 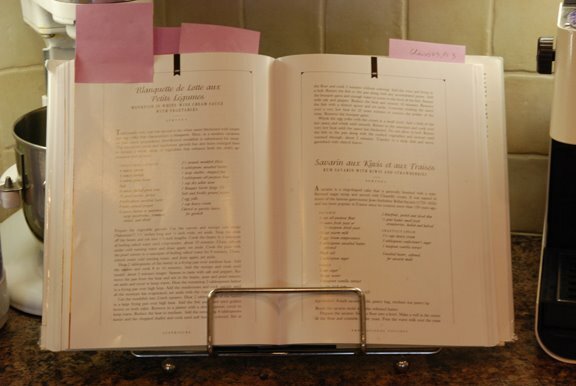 I love your mother's recipe holding technique - I do have a cookbook holder, but definitely will be employing her methods when I am cooking from three recipes at once! Hope you are recovered from all of that pan washing! That looks so good - that first photo is just mouth watering! That Blanquette looks fantastic! A refined dish! Sounds like a lot of work, but the results look worth it! I'm guessing this won't reheat well due to the sauce? Your fish stew looks fabulous, and lol about all the pots and pans. Thinking ahead helps a bit! I agree with your fish comments - eating fish gets trickier and trickier given overfishing/ farming issues. Love your mom's recipe method! MMMMmm I love monkfish! Need to do that soon! my mom has that cookbook and its the one i learned how to cook from. i found it in perfect conidtion at an antique store as hers is the the falling-out-pages-and-missing-binding edition. I am a tape and cabinet door recipe holder too. Sometimes recipes are hanging on my cabinet for weeks! I *heart* your mother - her recipe pages look just like mine, spattered with the ingredients used to make it. Anyone trying to figure out my favorites would have to look no further than for forensic evidence like this. Too funny! ps The stew looks delicious. Omgosh...Love that your LCBH is as posted up as my own! Rotfl! !